"Greetings, Beloved Ones! 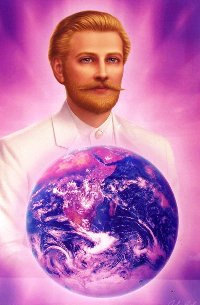 I am Saint Germain and I come in the Violet Light to greet you all and to invite you to come close, so that you may feel the warmth, the Love and the empowerment that it gives to each and every one of you. And I remind you that I offer this to you - this Violet Flame - to utilize for whatever transformations you choose to make, for we truly are One in Family, in spirit, and in destination! There is no holding back any more. We are moving in all areas and on all levels!!! "I have a presence here. When I say 'here,' I am saying 'with you, with every one of you.' And just as you are becoming more and more multi-dimensional beings, I am a presence in the third dimension as well as in the Higher ones. And so we can soar together, as High as you come! "And I am telling you that you have the power to bring yourselves even Higher!!! I understand that you may have some moments when you feel disempowered. Ashtar was talking about grounding, and this is good advice. * Reconnect with Mother Gaia and her Kingdoms.They may seem to be present only in the third dimension - and they still are, in all perceptions. They are still a presence, but the consciousness of Mother Gaia and her Kingdoms - almost entirely - has moved up and out of 3D! "So join with them. 'Get a ticket to ride,' as they say, and come along in the Light of the Violet Flame or however you choose, because you are all individuals who all have your own individual genetics, BUT – and this is huge – I will remind you that you all carry within your genetics the empowerment of the Alchemist -the ability to change whatever there is that you have within you to change!! "And as you rise in your dimensional levels, does it not make absolute sense, if you want to talk about sense – feel it right now, in fact, feel with your senses the Freedom from what some people might sometimes call the 'earthly cares' – what they are talking about is third dimensional situations, ensnarements, enslavements, stresses and worries! "You know, I have a bank and I have unlimited resources to stock that bank - not just from what's here on Planet Earth! I have already brought in, for instance, gold from Venus. I invite each and every one of you to use the Violet Flame as your entry. If you'd like to take a look at my bank, you might want to wear some kind of glasses because it's quite brilliant in my bank, quite bright! "Now, my bank, of necessity, is sitting in a bit of a Higher place, a Higher level of dimensionality than, you know, the lowlands of 3D - low locations, or whatever low levels there still are. But I do have storehouses on Planet Earth ready to remove money as the great divider, because when there is inequality in the world of economics or finance, then there is polarity. And there is inequality between the rich people and the poor people. There used to be sort of a middle group, but they pretty well have been obliterated. So you have the few wealthy and the rest of the World.This is a third dimensional creation, a low vibrational third dimensional creation. "And we, the Alchemists, are bringing it into balance so everybody will have Divine Governance and financial independence!!! Because you have been so indoctrinated with the whole idea, you know the saying, that 'money makes the World go round' – and so on and so on. That may be true if you have money; it's not so pleasant when you don't. And we know that a lot of you are still dealing with shortages, and so on. "Use the Violet Flame for yourselves as individuals, and then envision the whole World. Then take it a step further, where there is no money anywhere, because you are finally living in harmony with your Divine Gifts - accessing them freely because you finally know that you have them, and you don't need money to create or manifest whatever it is that you desire, because that's the ultimate destination!!! "So for now, in order to build the bridge and eliminate the great dividing polarity - I assure you that is why I started my bank and that is why I can tell you that I have unlimited resources to do exactly that. So, with Divine Governance - with Financial Freedom for all and Abundance for all leading the way into not needing money any more - and with the work that you, in this Ashtar On The Road Family and the other Lightworkers who are truly focused are doing, Planet Earth is evolving! Planet Earth is rising and Planet Earth is getting into the Higher levels of dimensionality which have to come about as a part of the Ascension process - so we have the Golden Age!!! "So I, Saint Germain, invite you to use the Violet Flame - or any means. Bring in the LoveLight! (You can do the Healing Hands** to bring it in even more to yourselves, to elevate yourselves, lift yourselves up and share it with the World.) Do it without ceasing! In other words, you can require that your intent be honored to be continually receiving and giving the Light, even when you are asleep, or eating, or driving your car. It does not have to be a continual meditation! It is simply that a part of you can be engaged while you are still partly consciously aware of - or at least primarily consciously aware of - your Lifestyles in what remains for you of the third dimension. "I am not telling you to completely ignore whatever responsibilities you have, of a third dimensional nature. I am telling you to apply the Violet Flame - the Golden White LoveLight, and all else that you have, that you feel to do - to elevate whatever there is that is of 3D into at least the very Highest 4D levels, free from stress, free from worry. And that is making a huge contribution to the evolvement and upliftment of all of Humanity because, as you know, Mother Gaia is already evolved onto the Higher levels, and that is where her consciousness primarily is! "So come on, Humanity, let's get with the program, as you might say and recommit to the Highs - to bringing yourselves up by whatever means you find most harmonious for you - then being even more, living Lifestyles that you came here to live as Divine Beings in human bodies!!! And so I thank all of you and I salute you for being here, for hearing the news and for sharing your LoveLights with all here gathered, and with all who come to listen, and beyond that with all the World, the Galaxy and the Universe beyond! And so it is. Namaste!"